Vault of the Heavens is an ancient and romantic term for the celestial heavens - where the planets, signs and stars reflect your life and your destiny. As amazing as it is to look at the wondrous canopy of the heavens on a clear night, so it is to see the stellar destiny of your astrological horoscope. 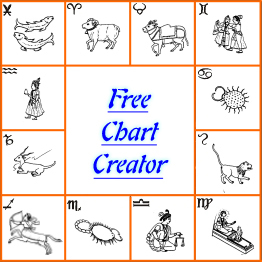 We invite you to enjoy the wonder of your life and your relationships through our Vedic Astrology reports. Relationship Capacity Report for Men - Want to check out your Man? This report reveals his ability to treat you right. Or if you are a man, see what's helping or hindering your relationships. Financial Days Report - A five year long list focusing on important "$" dates for your Finances. Love & Relationship Days Report - A five year long list focusing on important "Hot" dates for your Relationships. Predictive Calendar - "Looking Forward To it!" A one year calendar showing the days on which you can look forward to love, health, wealth, career, etc. Relationship Capacity Report for Women - For women only...just how ready are you for true love and a real workable relationship? Also use this report to check a potential partner's ability to be a good partner. Relationship Compatibility Report - the bottom line on whether you can really have a workable relationship with this person. Muhurta/Electional Date Finder - to help you find that perfect moment to start something new. Astrological Health Report with nutritional counseling based on your horoscope! "I look up at the stars and see myself. My heart is empty as the vast space above or as full as the many stars with the love just found. I see the distant impossibility of my life or the hope of a new start in that sparking star. I see my many friends all around, or the long distance between us that keeps us apart. Whatever it is I see when I look up, I see that it is rightly me."